A tiny green frog hops off floating leaves to stay alive. 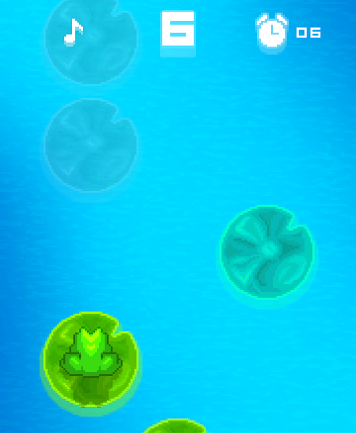 The game consists of two modes, the Tiny Frog mode and the Black and White mode. The gameplay is very easy, you only need to tap the screen with your fingers to make the little frog jump on the floating leaves, if you’re playing the Tiny Frog mode, or the black squares, if you’re playing the Black and White mode. You have to be careful, and use all your reflexes and promptness, to jump as many leaves or black squares as possible without drowning or hitting the white squares. Each gameplay will last for 15 seconds, so your aim is to beat your record and reach your maximum score in 15 seconds. Remember, the little frog cannot swim, and he’s scared of white floors, so in order for it to maintain its life you cannot hop in water or land on the white floor. The second our little tiny green frog touches the water, he is gone.